I wanted to share a recent app discovery with all my fit friends, family, and followers to start your week off right with some fresh fitness tools. Has everyone heard of Tabata? Tabata is a 4 minute fat-burning high intensity interval training circuit, a great way to incorporate cardio into your daily workout routine. I’ve been looking for a great Tabata timer, and I finally found one! 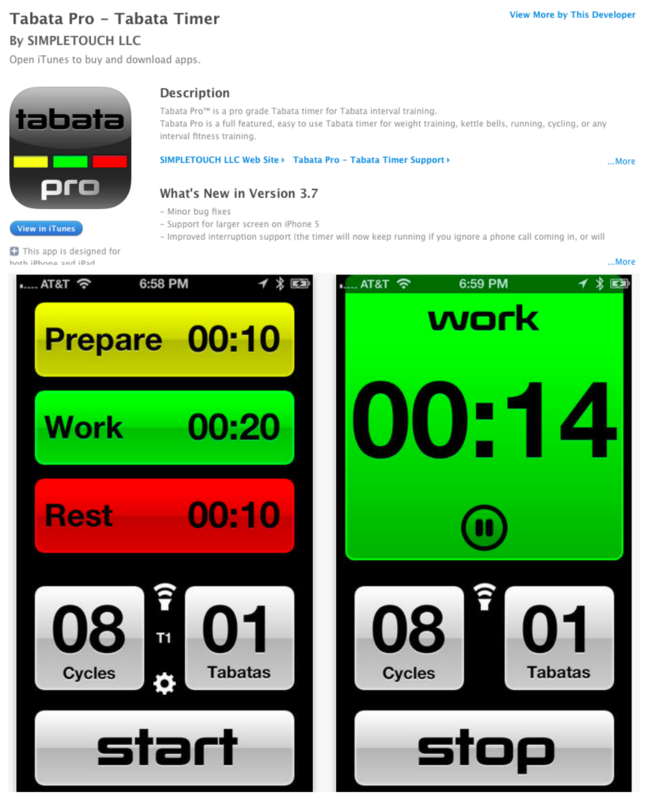 This weekend I downloaded the Tabata Pro Timer and I’m in love with it! It took me a second to figure out how to use it, but after fiddling with it for a few minutes, I figured it out! You can choose your preparation time, work time to perform reps, and rest time in between cycles. I typically don’t choose a preparation time, so I automatically change it to 00:00. Pros: Easy to use, excellent tool to keep your Tabata workouts accurate! Great flashing features and alarm features! Easy, fun, effective way to get your cardio in. Cons: No cons here, just a great app that every fitness guru who wants a great workout should have. This entry was tagged app, cardio, fit, fitness, healthy, heatlh, iphone, review, tabata, tabata pro trainer, training, working out, workout. Bookmark the permalink.